By Drew Price, who holds a Bachelors in Biochemistry and a Masters in Nutrition. Drew is a Registered Nutritionist, and has also been certified by the National Strength and Conditioning Association and the American College of Sports Medicine. Drew works with a range of clients and consults for various clubs and nutrition companies, as well as writing for Men’s Health, lecturing and holding seminars on nutrition and physical performance. If you want to train and compete harder and longer, and gain better results, then recovery should be your focus! The words above from US Coach Dan John encapsulate what it means, day in day out, to get good at a sport. Training is important of course, but in all athletic endeavours there are there are two phases to conditioning the body; training and recovery – and you spend many more hours on the latter. Recovery is when the body grows and adapts. After you train, your body wants to ‘super compensate’ between training sessions, so it can come back stronger and more able to compete. To do this it needs time, and the right support. Your body also needs to recover holistically – your muscles, your tissues (like those in your joints), and your complete body systems (i.e. your immune system), all need recovery support to get back to their full function. Below are some commonly used techniques. For the most part, they’re not rocket science or cutting edge, but they are the fundamentals that get the job done. You may be using one or more of them already, but they’re so effective that it’s definitely worth considering each and every one of them. A suitable whole food intake is the basis of any sports diet. ‘During race’ fuelling is often the emphasis, and it’s clearly important for longer efforts. However, I’d argue that generally the most important times to feed you body is right after training or competition. When a muscle has worked hard, the glycogen stores (the muscle’s energy supplies) are sinking low and the proteins from elsewhere are starting to be cannibalised for fuel. This is the catabolic state, and in order for you to shift into recovery mode, you have to stop this. Straight after exercise, consuming a drink with high glycemic carbs (such as a sports drink) and an easily digested protein (such as hydrolysed whey) will feed your muscles when they are primed to receive the nutrients. Any sugars and amino acids consumed are sucked up by the muscles, stimulating repair and recovery of glycogen stores. If you’ve just had a long hard run or strength/cross training session, try to consume 1 gram of carbohydrate and ½ gram of protein for every kilogram of your body weight in the 20 minutes after training, starting immediately after training. This is then followed-up, say 20 to 30 minutes later, with a whole food meal. This meal should be rich in carbohydrate and lean high quality proteins. Go easy on the fats and fibres here as they slow stomach emptying. The emphasis is still on speed of delivery. At other times, increase the quantity and variety of healthy fats and colourful fibrous vegetables. The research is now pretty clear. What you consume before and during the race or longer training sessions not only affect your performance in the time session, but also your ability to recover after it. What is interesting is that, though the emphasis is usually squarely on water, followed by carbs, followed by electrolytes, protein also aids the utilisation of carbohydrate and also reduces signs of fatigue. In addition, protein will kick start the recovery process at the point when this becomes an issue – when the damage to muscles and nutrient stores is happening. 10 grams per hour seems to be sufficient, so depending upon intensities and so on, you’re looking at something like a 1:3 to 1:6 (or maybe even higher) ratio of protein to carbohydrate. I suggest going into your local bodybuilding supplements shop and looking out one of those fruit flavoured (i.e. non-dairy tasting/looking) protein drinks. You’ll get a few servings out of the bottle, as they’re typically 30 grams protein. So mix say 1/3 of the bottle with a sports drink and freeze the rest in ice trays for later. If this seems too fiddly, consider mixing some of the classic ‘recovery’ drinks with your sports drink of choice. 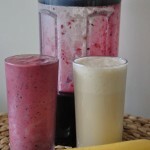 Specifically, I am talking about recovery drinks that are non-dairy in look, mouth-feel, and flavour, in addition to featuring easily digested proteins. Let’s not overlook hormones! I’m not suggesting you go down the route of some athletes. I am referring to the cheap, easy and totally legal supply you can obtain at home, whilst you sleep. When you sleep, you produce a plethora of hormones that stimulate growth and repair. Growth hormone and testosterone make a potent ‘stack’ and are squirted out by the endocrine system during REM sleep, stimulating anabolism, the process of recovering and replenishing physiological systems. Sleep also causes muscle paralysis. It is at this time that the body really sets about working on that damaged muscle tissue. Good sleep improves your nervous system’s ability to fire the muscle fibres and increases your ability to focus and concentrate. It also speeds up reaction times and allows you to properly learn the skills you need to perform, something that is a definite advantage when fatigued. Deep restful sleep is what you need, and ideally you should be aiming for 8 or more hours a night. In today’s world, this can be hard to achieve. However, there are things you can do to ensure higher quality sleep. Give your bedroom a once over. Do the curtains keep out the light? Is it cool and quiet enough? Do the pillows or mattress need replacing? Avoid using computers and smartphones in the hour before bed, as the blue light they produce inhibit the production of melatonin, instead signalling to the body it is still day time. If you must, look into software like ‘f.lux’ that reduces this blue light. It may be the last thing that you want to do, but moving those trained, tired, aching limbs may be one of the best things you can do for them. Low intensity, low impact exercise, such as walking or using a cross trainer for 15 minutes, will warm the muscle. This stimulates blood flow, which delivers nutrients and removes metabolic waste. Golf is popular amongst many athletes for this very reason. The movement itself will help break up the microscopic adhesions in the muscle caused by hard training and will increase the production of synovial fluid, feeding and lubricating the joints. We can’t all afford either the time or the expense of regular sports massages. However, you don’t necessarily have to have regular and total body massages to feel the benefit. A 15-minute massage on a problem area, say one that feels unusually tight, every 2 weeks can have a great effect reducing the tension in the muscles, breaking down the microscopic tears in the fibre and stimulating lymph flow. Also there is another even more cheap, convenient and effective route. Foam rollers and trigger point balls are inexpensive and highly effective tools for improving performance and reducing the risk of injury. 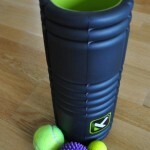 Foam rollers (about 1m long, 10-15cm in diameter and quite solid) are great for myofascial release techniques. Not only are they cheap and easy to use, but they are brutally effective at reliving stiffness and improving the quality of the muscle tissue. They work by deforming the muscle and inducing a localised stretch that the muscle cannot resist. This helps separate the matted layers of muscle tissue, meaning you improve the contract-relax cycle. A trigger point ball is a more concentrated dose of the same thing, allowing you to get into particular parts of the muscle. A golf ball and a hockey ball provide all the options you need for working on glutes, hamstrings, calves, feet and so on. They are some of the best ways to go about avoiding injury and probably the best money you will ever spend on your training. After a long hard training week, take the time to have a warm to hot bath, with around 300g of Epsom salts in the water. This can decrease inflammation and also increase blood flow to the muscles, which helps clear waste from the tissues. 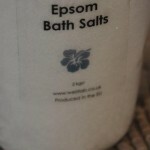 Epsom salts contain magnesium sulphate. This has been shown to increases blood magnesium levels, which is incredibly important for a couple of reasons. It’s a mineral athletes are often lacking, which is vital for proper muscle function and also hormone production. Magnesium also promotes relaxation of muscle tissue, which obviously has benefits itself, but can also help relax the athlete and promote better sleep quality. As such, the positive effects add up. Again, this is a simple method of speeding up recovery, but one which is often overlooked. Use once a week for the best results, and remember to take some iced drinking water into the bath with you to help stay hydrated. These methods may seem a little simple, but they can take your training to the next level and see you push past training plateaus. They’re the bread and butter of individual athletes and also sports teams. Making their use a habit will help you train harder and also support your health into the future as well.